What is it and why was it introduced? The utility mark Utility clothing was produced to aid the economy and help the war effort and although not actually being of military manufacture it is arguably getting close to a 'civilian uniform'. Utility Clothing was introduced towards the end of 1941 by the British government with several purposes in mind. Raw materials (cloth, wool, leather etc.) were in short supply and had to be conserved. Manufactures needed to become more efficient in their working practices (Much of the skilled labour had left to fight). Clothing prices (which were increasing) needed to be kept down so that the civilian population could afford clothing of a reasonable quality. The Utility Clothing Scheme in the large part succeeded in these aims. Utility clothing was stamped or labelled with a utility mark (CC41), the two C's looking more like 'Pack Man' figures than letters. 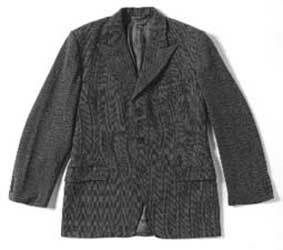 A utility jacket The government took control of the import and manufacture of raw materials and supplied cloth etc. to manufactures. Manufactures were encouraged to produce a limited range of garments and therefore produce longer runs of garments using this 'Utility' material. This obviously increased efficiency while reducing the choice available. The style of garments produced were also subject to 'austerity' regulations, which restricted how much cloth was used. For example, pockets were restricted, a maximum length for men's shirts was introduced and a ban on turn ups for men's trousers caused much heated debate. 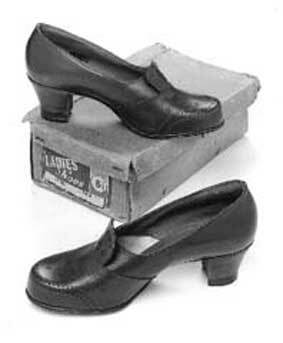 Utility Shoes Utility clothing was also subject to price regulations. Profits were restricted for both manufactures and retailers which resulted in Utility clothing being significantly cheaper than non-utility clothing when first introduced. This together with the initial dislike by some retailers of reduced profits may have given utility clothing its bad name. Although initially there was a great deal of hostility directed at Utility clothing by the general public this reduced as more of the clothing reached the shops. The public was surprised to discover that the clothing varied in style & colour and was generally hard wearing and good quality. The utility scheme also included furniture as well some other items and continued past the war until it was finally withdrawn in 1952. There is now an excellent book by Mike Brown "CC41 Utility Clothing" which is not only beautifully illustrated but covers the whole area of Utility Clothing in superb detail. If you are interested in CC41 clothing of Fasion in the 1940s then its a must have. If you are interested in CC41 Utility Furniture the the book by Jon Mills "Utility Furniture" not only covers details of the scheme but also includes a reproduction of the first Utility Furniture catalogue.